DId you decide to surprise your dear person and send him a bouquet of flowers to another country? Online store Megaflowers will help you with this! We have a large selection of flower arrangements, reasonable prices and excellent service. Distance is not an obstacle to make a loved one a nice gift and remind you that you love him and miss him very much. Megaflowers will be glad to help you with this & ndash; here you can always order a bouquet of flowers to another country! Do not hesitate, a pleasant surprise will cause the most vivid emotions to the one to whom you are sending it. We offer a large selection of different bouquets & ndash; luxurious roses, exotic compositions, tulips, gerberas, and the list goes on. Of course, you will be interested in how to order flowers in another country. Therefore, we have prepared for you a detailed guide to action, which you can read right now. 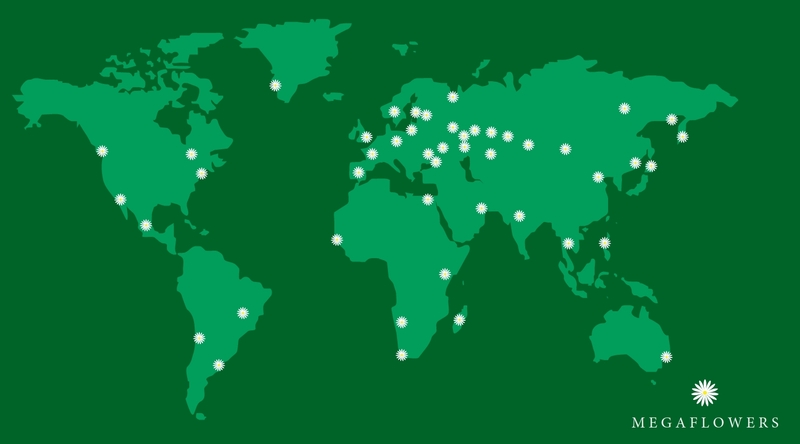 See the full geography of our deliveries here. So, how to deliver flowers to Russia? Flowers will be delivered to the recipient within 3 hours from the moment of payment or at the time specified in the order, except for holidays and delivery abroad. In any case, we make every effort to make delivery even faster. Terms of delivery to Russia, see here. So, how to deliver flowers to another country? First you make a preliminary request & ndash; 2 & 3 days before the date you want to send the bouquet. You select the country and flowers on our website, and then place your order, but do not pay for it. The cost will be shown approximate, it depends on the specific delivery address. And the final price of the order will be reported by our manager. It is important to consider the mentality and national characteristics of the country to which you are sending a gift. Obviously, each state has its own established traditions and foundations. For example, orders may not be delivered during certain public holidays and other nuances. Also, when ordering a bouquet abroad, please note that the range there may differ from ours. In this case, you will be offered an equivalent replacement. Your order will be delivered within a day. We try to do everything possible to ensure that the addressee receives a gift in the specified period of time, but, unfortunately, we can not guarantee it 100%. If for some reason you are not satisfied with the quality of our work, we are completely & nbsp; refund you the amount paid. Delivery will be possible already after 2 - 3 days after you left your order. This is a very short waiting time, but often we try to reduce even it! You always know the status of your order thanks to the messages that will be sent to you via sms and email. You can always choose a convenient payment method for you – card, terminal, electronic money, etc. Together with the bouquet we will send a beautiful card, which will be free for you.